Last night: me with my award and Eric Lanlard. I won! The Fortnum And Mason Best Online Food Writer Award 2014. This is only the second year of these awards but already it has the clout and glamour of foodie oscars. One feels one should be above it all, awards that is. But hell, I’m gonna bask in the glory. My blog contains no advertising or sponsored posts, I’m not paid to write it, so awards like this are fantastic for giving one the impetus to continue. The actual award itself weighs a ton and could be effectively used as a murder weapon. I drank champagne in the turquoise top floor then afterwards, took the lift downstairs where, rammed in the basement bar, the food world sat on each others laps, boozed and tucked into Italian canapés, gossiped and flirted. Such fun. Here is a list of the other winners amongst some great, high quality shortlists. Special mentions for best online restaurant writer Chris Pople, best restaurant writer Marina O’Loughlin, best cookery writer Rose Prince and best radio award for the team of The Food Programme. Well done, Kerstin. Always rewarding to receive recognition. Congratulations from Spain…you write about Fortnum and Mason, which is a shop I´ve been buying goods from for many years now and I read you from the north of spain. Well done you…and so richly deserved! I thought I'd dress up a bit! Congrats from Scotland. 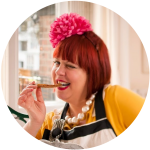 Good for you – well deserved; still the most entertaining and original food blog.